5 men with shotguns were waiting for us in the van. Inside another man shun the flashlight of his phone to show us where to sit. The seriousness of the situation quickly got to our heads. When the van stopped at hotel Pacific, in which we had stayed a couple of days, all the windows were barricaded and doors were locked. I felt like we were about to storm a fort. We followed the inspector closely, who took the lead. And so I found my money missing. It’s the first time I didn’t lock my bag in hotel Pacific. Right before, when entering our room, one of the hotel-boys tried to follow us inside. It felt like he was antagonising us, deliberately scaring us in the form of a joke. I’ll never forget the eyes of this boy — it’s like he was possessed with pure evil. I hate exaggeration, but I can’t describe it otherwise. It’s just before we discovered the bags were moved and the money was stolen. Adrenaline rushed through our veins. We decided to report this downstairs with the hotel manager. Mevish stayed in the room. I locked the door and went down. One of the other hotelboys was still sitting on the stairs. He didn’t look at me and neither did I at him. Suddenly he said to me “lift open”. I was so lost in thoughts that I didn’t notice the elevator had arrived. I mumbled something to him that I was tired, but I was feeling anxious and stressed out. My gut feeling told me one or both of them had stolen our money. The manager asked me at least 5 times if I was sure. Of course I was. But I also felt as if they tried to undermine me. Before I noticed the camera’s in every hallway. I asked if I could take a look at the recordings. The head-manager wasn’t here today as I was told. So it was not possible. “Tomorrow you can”, he said. There was a different manager at the reception and he basically told me he could not open the recordings. As I continued to complain, he finally succumbed to calling the head-manager. He gave me the phone and I explained the situation. Is the first thing he said to me. He was right, of course, but that’s not how you are supposed to talk to your paying customers. So I kept demanding to have a look at the CCTV recordings. He angrily screamed at me through the phone, blaming us for our mistakes and while he kept blaring on I annoyingly hung up. When we tried to leave the hotel, the manager that gave me the phone, was being very adamant about us paying for the night we stayed. This is quite unusual. In every other country we pay when we check out. In this hotel, they demand that you pay for every night. This didn’t sit well with us. So we lied we couldn’t pay because they stole our money. It was the only leverage we had. We still tried to enjoy the rest of the day because it was one of our last ones. Most of the time we spent working and we decided to take a small tour of the city with Ali, our guide. Outside the hotel, Mevish told me they didn’t care at all, they actually didn’t want to help us. It was then, that I realised that they essentially work together with the thieves. After a day of touring with our guide Ali, we asked him to drop us off at the police station. At the police station we were sent to the head-inspector. He smiled at us and his calm expression had an aura around him that felt simply… intimidating. A man of power. While I was explaining our situation, I felt as if he was inspecting my every word. He called hotel Pacific and had a talk with one of the managers. After he hung up, he set up a huge grin on his face and said that we hadn’t paid the hotel yet. With his broken English he said: “So it’s only 30 euros you still have to pay”. Mevish realised immediately that he did not understand my explanation before and this time explained very slow and carefully that actually our money was stolen. Now, finally, he understood. His expression and demeanor changed — the power of a woman — and he send one of his inspectors with us back to the hotel. In the next 2 hours it was them, 2 of the managers, demanding the hotel money from us and us demanding the video recordings and the inspector in between. They refused to show us the recording as their head-manager was in the south of the country, which is a 12 hours train ride away. They offered us a free stay, but we didn’t feel safe and we did not want to stay. Their whole staff was downstairs, 8 men (including the 2 hotelboys) were looking at us with only the inspector in between. We told the inspector we didn’t want to stay in the hotel that evening, that we didn’t feel safe because they can open our door any time they want. Another long and heated discussion ensued, mostly in Bengali and I suspect them complaining that we were running off with their money. But as tourists our wish was taken quite serious, especially when we emphasised our need for safety. It was just a month ago that Japanese tourists were murdered in the north of the country. The inspector allowed us to leave with our luggage and gave us his phone number. Our guide Ali, who was waiting outside the hotel, brought us to different one. Ali also told us he saw the head-manager quickly sneak out when we entered with the police. I basically lost all hope getting our money back. I told Mevish we should at least try to enjoy our next and last day in Dhaka. We hardly slept that night. After a long day, which we tried to enjoy, we discussed our doubts and decided to go to the police station again. I first tried to sms and call the inspector from last night but he didn’t reply. We felt there was no hope and I really started to doubt if the police would help us at all. We arrived in the police-station and took place in the waiting room. This time a different inspector approached us. He told us to follow him and he led us to a van in which 5 police-men with shotguns were waiting for us. With our puzzled looks we sat down. Mainly scared, but also a little hopeful, we drove off to the hotel which to our surprise now looked like a barricaded fortress. Locals were watching us get out and stared, curious what was going on. We followed the inspector. Once inside the hotel, one of the hotel managers that was nice and decent to us before, immediately approached us and wanted to talk to us privately. He told me that after viewing the CCTV they found the money and the boy who did this. He explicitly asked for “my humanity for this situation and the faith of this boy is in your hands”. It made me worry what would happen to the boy. 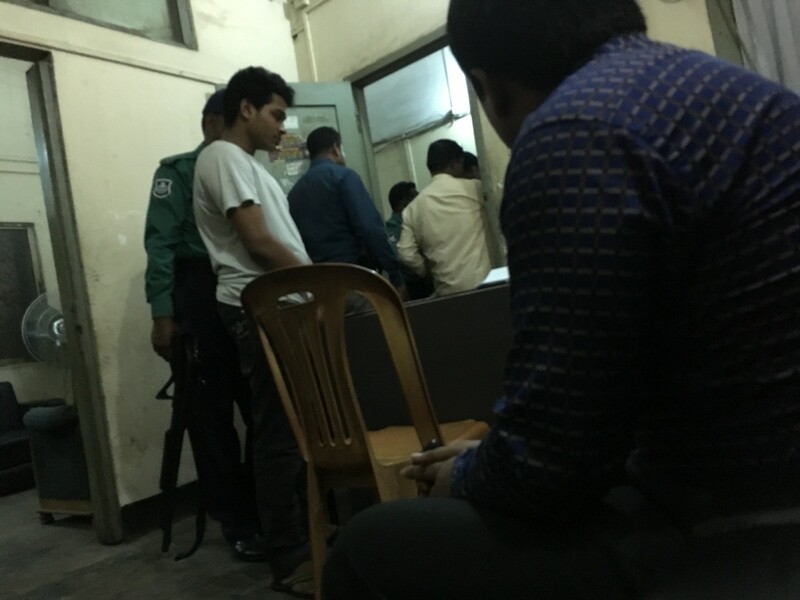 Punishment can be quite serious and I can’t imagine what jails in Bangladesh would look like. But the thought of forgiving faded in a heart beat with the memory of the angry head-manager calling me an idiot on the phone. All the lies they gave, the intimidation from the hotel-boy and how they tried to pressure us into paying every night. They are guilty and should be punished — all of them. I thought for a few minutes and let my emotions subside. Once calm I tried to make the most rational decision and came to the conclusion they’ve must have done this before. Other tourists who didn’t call the police. Who might be scared and fearful too. I looked and inspected the workers of the hotel and I could see the fear on their faces for the police. And I could only think of one reason why — they’re all guilty. They showed me the plastic container that had my money. I checked and only found $30. The greed and desperation for money in this country is sky-high. It only made me aware of their guilt. I threw the plastic container on the table and demanded the rest. The manager transferred my anger with his on top at the hotel-boy. He ordered him to return all the money. This time whilst being escorted with two other police officers. A few minutes later they came back down with the rest of the money. Now I demanded to know where the head-manager is. Both me and Mevish had the suspicion it was the guy in the dark-brown suit. The other managers again lied to us, but we kept demanding to speak to him. Our suspicions were right. When I pointed at him and demanded to know who he is, he quickly tried to introduce himself to me. I ignored his handshake and confronted him immediately. “I saw you yesterday! You were standing next to him!” I lied, but remembered what Ali said. Of course he refused. He was a lying piece of SHHH***. Now I felt my decision to continue the arrest was completely justified. His complete business and personality is probably built upon lies and mistreating others. He even refused to apologise for what he said to me on the phone. Was I surprised by now? Nope. The previous manager begged for my compassion again. I got up and talked with the inspector in private. Thought I was assured they should be punished, I was curious to know what would happen. He didn’t explain and said it was just about my decision. I decided and wanted the managers and the boy arrested. Unfortunately the boy with the evil eyes had somehow sneaked out. We left the hotel and the head-manager came over to me. he tried to apologise. I couldn’t believe it, this was like Walt Disney movie where the villain desperately asks for forgiveness and compassion. It was his last move. But just like in those movies, they will backstab whenever the possibility would arise, thank you for teaching me Walt. I could see right through his intentions. He is the kind that would do anything to get his way. For our own, and others, safety he better be put in jail. The hotel-boy and the managers in the doorway. Wish I had better pictures of them. We arrived in the small room of the head-officer. We would now see the aura of intimidation as a spectator. From Walt Disney we went straight into a classic old mafia movie. The intimidation started with words we couldn’t understand, it was all in Bengali. Everyone had their heads lowered, they were all afraid. He turned around and grabbed a thick heavy bamboo-stick from behind the counter and laid it on the glass table. Everyone was gasping for air when the sound of hollow bamboo hit the glass and I saw visions of him breaking his fingers right in front of us as a display of power. After a long talk we didn’t understand, the boy went down on his knees in front of me, touching my knee. Afterwards I wished I could make clear I really wanted the head-manager to be punished. But in these moments I was unable to forgive anyone. I waved him away. They were all criminals in my eyes. This was confirmed when one of the agents returned after investigating their rooms. More money from all kinds of different currencies were laid on the table. We were left now with the head-officer. He started noting down our answers and this turned into a 4-hour long interview for their rapports. It took extra long because often they misunderstood us and had to refill forms. They confirmed the amount of money stolen about 4 or 5 times. Hungry and tired we were happy we had brought some leftover food. We offered some to the inspector and we basically forced him to eat with us. We laughed and it was even funnier when we asked for a selfie. After this the officer called his wife and daughter and gave his phone to Mevish. The seriousness of the situation had completely dissipated. He gave us his business card and offered to show us around when we visit again. 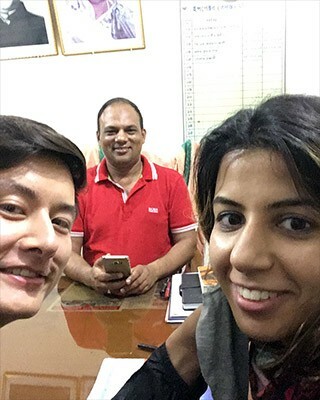 We promised to call him, next time we’re in Bangladesh. The thought of spending holiday with the head-officer of the police still humours me, but that sense of intimidation when I met him the first time never really left me. 4 hours later we were finally excused to leave. One of the inspectors got up and told us to sit in the waiting area whilst they looked up our hotel address to drop us off. When he called us, we got up and I saw one of the hotel Pacific managers come in. He gave me a big wide smile — as evil as the boy with evil eyes, straight from a cartoon. I didn’t understand why. They got arrested and he smiles at me? In the car Mevish said she was sure that the manager overheard the police talking about our drop-off. Strangely they weren’t locked in a cell and were just wandering around the police station and were able to make a phone-call to anyone. This scared the hell out of us. They could just call and pay someone to stab us. We told the police inspector but he assured us everything would be okay. The inspector talked to the reception of the new hotel and came to check if our room was safe. Then he took a selfie with us and gave his business card. Once he left we felt unsafe. Having discussed the situation with the inspector our intuition continued to rule over his echo of affirmations. There was an abrupt knock from the door. Our heartbeat raised sky-high and it was 3 times we asked who was at the door before we even considered opening it. It was just the hotel boy with our laundry. We were super scared, it’s obvious and it absorbed us. We decided to leave immediately and not leave any tracks behind. This was our last night in Dhaka and we wanted to leave in one piece. Don’t forget, Bangladesh is considered a 3rd world country and I wouldn’t be surprised the hotel-manager is capable of arranging… anything. A single call could get us into trouble. I actually suspect him of being part of the local mafia. I started imagining he could pay someone to stab us with for probably less than a hundred dollars. As quick as possible we left our hotel. We made sure to take a rickshaw a few blocks away. Then we told him the wrong hotel and we would walk another few blocks to another one. When we finally arrived in our new room we felt safe and relieved. Our paranoia was subsiding and we were able to sleep a couple of hours before leaving Bangladesh the next morning. Although this story contains many moments of intimidation, we never were in real immediate danger. It was our fear and our paranoia that drove us to be precautious and I’m happy we took the extra mile. At first we didn’t take it as serious. The people we met in Dhaka were always really friendly and hospitable. But when we walked the streets in the evening with everyone staring at us, we were send back by police strolling the neighbourhoods. Never forget this is a country still recovering from war. Many were killed, raped or left behind without a family. I saw so many sick and damaged people — it’s truly a tragedy. The country is still licking it’s wounds decennia later. Always be on the safe side. 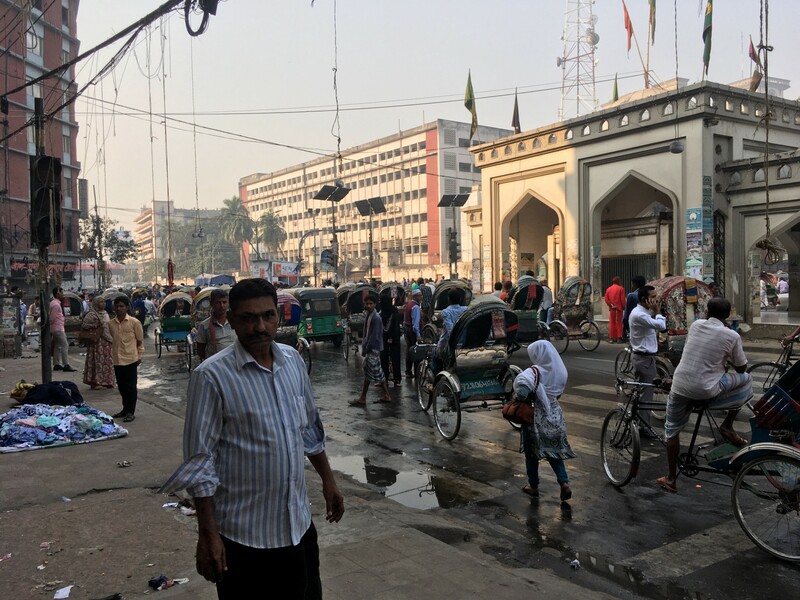 If you want to know more about Dhaka, read my other article: How to survive Dhaka, Bangladesh.